Something that Slam Allen will tell you is that he is not a Blues man, he’s an entertainer. Something he honed in his 9 years working with James Cotton and then his long time work bringing people into the Blues while working with Norwegian Cruise Lines. Some artists choose the Blues, but the best are chosen by the Blues. Slam was truly chosen by the Blues and he has the soul and heart to tell them true. Growing up Slam started out playing with The Allen Brothers, a soul band, where he played the drums. it wasn’t until later in life that he took up the guitar. The Allen Brothers were a close family band that brought the music of the south north when they moved to New York state. They’ve created a legacy of great music and through Slam are continuing to bring the Blues to new people every day! There aren’t many artists that can bring giants like BB King with the guitar and the energy of James Brown. His website has it right when he describes these things. And truly it’s not a boast or a false self promotion. Slam Allen has a gift to bring the Blues of the past and carry them into the future. With artists such as himself and a select other few, the history (and future) of our music is in good hands. But, not only does he help keep the past alive, he also keeps the future bright for new and fantastic original music for us to enjoy for years to come. Slam’s newest album, Feel These Blues, is something that needs to be in everyone’s playlist rotation. With the title track being an instant hook, the only thing that makes it better is seeing him bring it to life, live and in person! A great medium speed boogie that drives hard and displays his guitar skills in a grand and slinky fashion. Taking his years of hard work and honing his craft he fills the room and then holds the entire audience in place with stunning guitar and a voice that reaches right into the center of your Blues heart and lets you know you are at home. Not only does Slam keep the Blues alive but he brings the classics of Motown right along with him. Playing many of the iconic tunes that we all instantly know the words to, the whole event turns into an amazing sing along as his voice and skill reaches into your memory and brings the joy and history of the explosion of the R&B era to life right in front of you. Along with Slam are his long time musical director and bass man, Jeff Anderson. 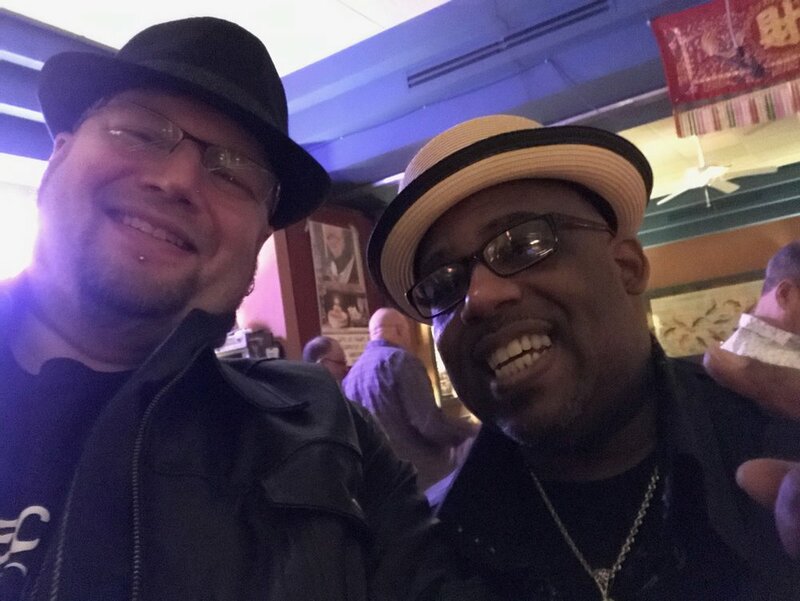 As his companion and the perfect bass line balance to the searing and soaring guitar, Jeff is a one man powerhouse of the classic Blues and traditional style that meshes perfectly with Slams focus on the past and future blending. With these two great blues men was Liviu Pop! 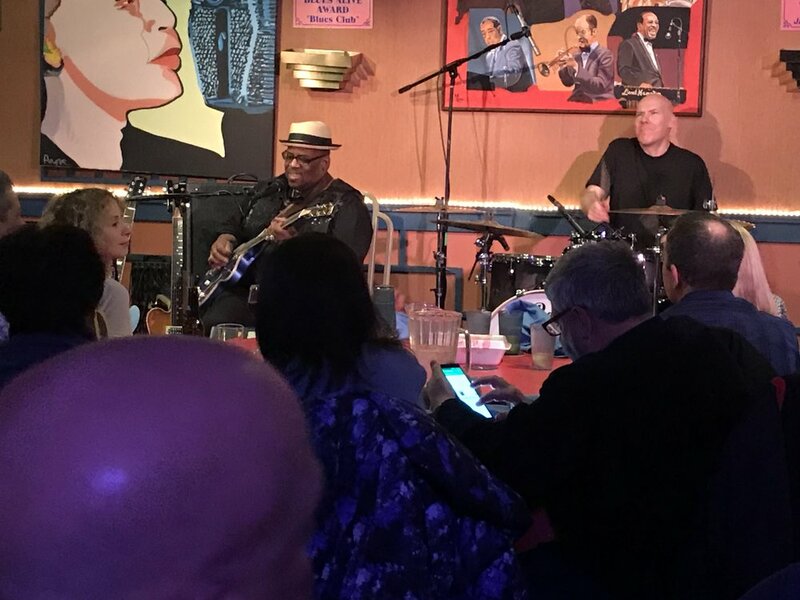 A local institution unto himself, Liviu has a regular invitational at the Connecticut venue Black-Eyed Sally’s in Hartford. Full of energy and passion, Liviu carries a smile and a genuine connection to the beat he is bringing to life. Never once are you left to ponder whether he is playing in the genre to pay the bills alone or if he is playing his heart out because he truly loves what he does. There is a pure passion and unstoppable energy that radiates off of him. 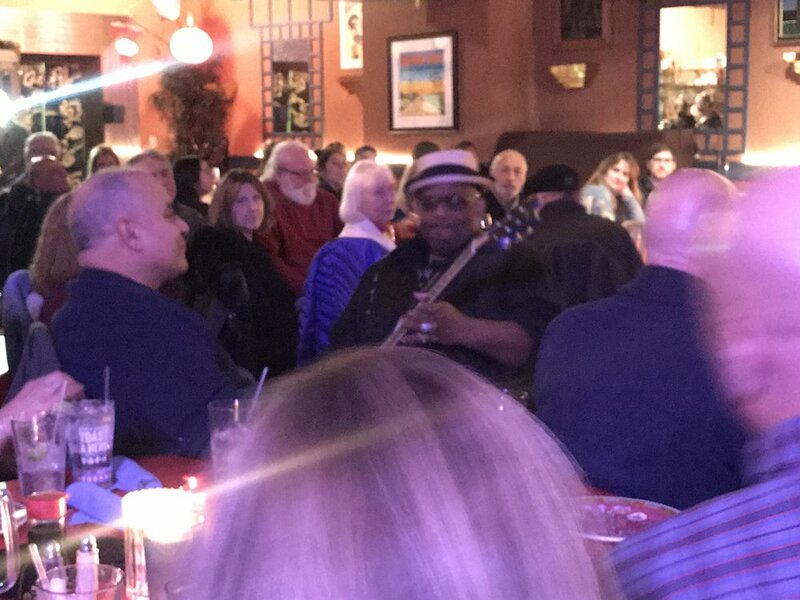 Chan’s was a great venue to see this titan display his talents with a packed room and his interactions with the audience being genuine and full of humor and appreciation for the people who come out to support the Blues and himself alike. At one point he invited any guitar players in the room to come up and jam on his beautiful sky blue guitar. Not sure what to expect, a gentleman in the front (Paul) stepped up to the plate. And in a moment that you’d never expect, Paul took up the guitar and blew away the audience and Slam alike. Taking his time and full energy he showed that the Blues community at large has talent ready to stand up given the chance. And this was not a wasted moment. Jokingly, Slam also commented that when you come up on stage to play someones expensive guitar you’re not supposed to be that good! Well, this was a great moment in the night where the audience and the artist truly connected! Playing two sets of rocking classics and originals, Slam is a guaranteed night of fun and great music! I can’t wait for his next trip to the region where I can catch him once again bring his music and the audience to life! Keep an eye out on his tour schedule, and be sure to pick up his albums to enjoy until you get the chance to see this artist live in person!